Why do a carpentry stint before going to university? She studied in Nanyang Girls' High and Hwa Chong Institution, so few would expect Ms Kwa Mei Jun to be hauling wood in a furniture workshop at age 20. But that is indeed what she is doing and she does so with skill, expertly operating a computer-controlled wood carving machine to create a piece of furniture for a customer. Her account of how she ended up working in a furniture factory is intriguing. Her A-level results were good enough to secure her a place in a local university. But while her classmates were trying to decide between law or medicine, and between local or foreign institutions such as America's Ivy League universities, the soft-spoken Ms Kwa was asking herself if she should even take the university route. It stemmed from the fact that she could not decide on a degree course that would capture her interest. "I didn't know what I wanted to do, but I knew what I didn't want to do - to end up in a degree course that wouldn't interest me and where I would be wasting my time." In the end, she bravely decided to buck the trend and wait a year or two until she had a better idea of what course of studies she wanted to pursue. 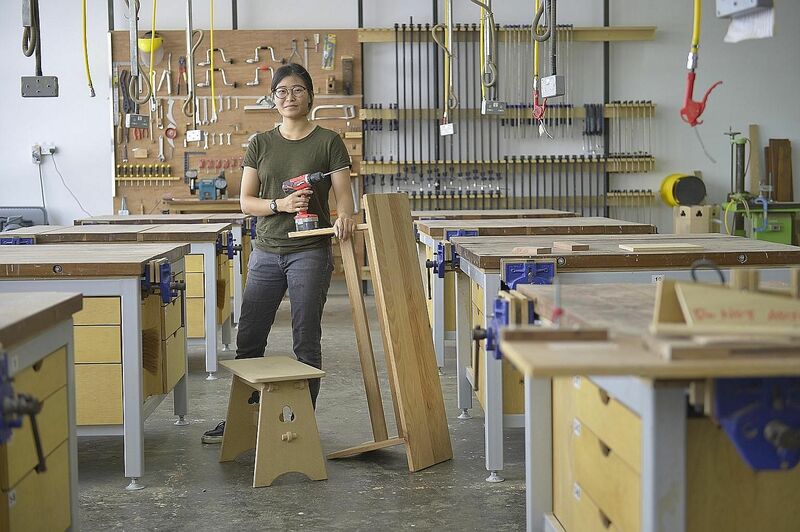 Meanwhile, she took up a one-year wood craftsmanship apprentice course run by the Singapore Furniture Industries Council Institute, where she had to work in a furniture factory and learn how to craft furniture. Fast forward a year and a half and Ms Kwa has no regrets taking the path less travelled. Over the past 18 months, she has discovered her knack for operating complicated machines and a fascination with the design process. She is now ready to head to university to take up an engineering course, but one that combines the science with design thinking. Although still in the minority, Ms Kwa is among a growing group of young Singaporeans - many in their late teens and 20s - who are taking the road less travelled to discover where their inclinations and talents lie. And they are doing so even when that means disrupting their university studies or forgoing such studies altogether to embark on a journey of self-discovery. Some of them were featured in the Paths to Peaks series that The Sunday Times ran over the last four weeks. Among them is Mr Viren Shetty, who dropped out of his applied mathematics course at Nanyang Technological University two years ago to start PlusMargin, which uses artificial intelligence and behavioural psychology to help businesses predict how consumers behave on websites. Since then, his start-up has raised more than $1.5 million in funding from investors and PlusMargin has eight full-time staff based here and is expanding to the United States. Mr Shetty at age 24 has made it to this year's Forbes Asia list of 30 Under 30, which recognises the most influential people across industries such as the arts, healthcare and science. Another young man who was featured in the series was Mr Goh Wei Xiang, who gave up a place in a top junior college to go to a polytechnic because of his interest in nautical studies. After polytechnic, he again chose not to take the well-trodden path to university. Instead, he seized an opportunity to become the first Singaporean to be accepted into Trafigura's global commodity trading apprenticeship programme. And just two months ago, he marked another milestone when he became the first non-degree holder here to join trainees from prestigious universities in the company's highly competitive graduate programme. He is part of the gasoline operations team at the firm and enjoying his work. But while an increasing number of young people are ready to take the path less travelled to discover their likes and dislikes and where their talents lie, many of their peers are not. Far too many school leavers still base their higher education paths on their grades and the prestige and future earnings that come with certain degrees. Many also go where their friends are going. Parents understandably want their children to take the route that will secure them a good job and a good life. But many of them push their children into courses which they have no aptitude for. This is painfully evident during the junior college and polytechnic admission exercise held yearly after the release of the O-level results. You see many parents insisting that their children choose the JC route over the polytechnics. They prefer the JC route because they feel that it will make it easier for their children to win a place in the local universities. It's no surprise then, that Ministry of Education figures show that 400 to 500 students switch from junior college to polytechnic each year. Most do so in the middle or the end of the first year of junior college. Several students make the switch in the second year or even after completing their A levels. While an increasing number of young people are ready to take the path less travelled to discover their likes and dislikes and where their talents lie , many of their peers are not, and neither are their parents. Far too many school leavers still base their higher education paths on their grades and the prestige and future earnings that come with certain degrees. Many also go where their friends are going. Parents should take advice from Minister Ong Ye Kung, who oversees higher education and skills development. In a speech to Parliament earlier this year, he said that education - besides being a pathway to good jobs and lifelong employability - also needs to be a journey to fulfil hopes and aspirations. And the two need not be at odds with one another. Over two decades as an education reporter, I have met many Institute of Technical Education (ITE), polytechnic and university graduates who have gone on to excel in their chosen courses and then the related careers. When I speak to them, I find the one thing that comes through is that they all love what they do. When you probe further, it becomes clear that besides having developed a genuine interest in their field of work, they had also spent a lot of time honing their skills. Education and creativity guru Ken Robinson would say they have found their element. In his book Finding Your Element: How To Discover Your Talents And Passions And Transform Your Life, he says to be in your element, it's not enough to be doing something you are good at. To be in your element, you have to love it. That still leaves open the question of whether they will be able to make a living from their passion. But given the rate of disruption across industries and jobs, it may well be that young people will have to create their own jobs in future, and they will be better placed to do so in areas where they have a genuine love of the subject. As for the Government, it is nudging students in this direction by having schools step up education and career counselling. Tertiary institutions are encouraging, even requiring their students to take up internships to try different jobs and industries. The Ministry of Education has diversified the course offerings in ITE, polytechnics and universities. Degrees being offered include culinary science, digital design, game development and animation and physiotherapy. More importantly, the ministry has expanded aptitude-based admissions in universities, polytechnics and the ITE, where an applicant is assessed on his interests and on whether he shows the potential to do well in his course of choice. But parents, educators and employers must also play their part. Parents need to move away from the thinking that good academic grades and prestigious degrees will deliver the good job and good life. They don't any more. It's more about what you can do with what you know. I have said this before and it bears repeating: Employers, including the Government, must hire based on interest and skills, not grades. For Singapore to flourish, we must build the "mountain range of talents" that Prime Minister Lee Hsien Loong talked about years ago. We must all do our part to help Singapore's young people find the sweet spot where their interests, skills, and opportunities meet.